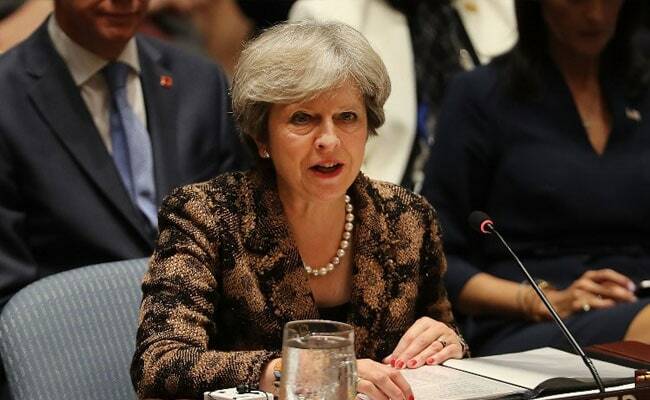 LONDON: Divisions over the future of British Prime Minister Theresa May burst into the open on Friday with allies saying she should carry on and a former Conservative Party chairman claiming the support of 30 lawmakers for a plot to topple her. In one of the most bizarre British political speeches in a generation, May's address on Wednesday to her annual conference was ruined by a comedian handing her a bogus employment termination letter, repeated coughing fits and even by letters falling off the slogans on the set behind her. May's authority was already diminished by her botched bet on a June snap election that lost her party its majority in parliament just days before the opening of formal Brexit talks with the European Union. Under the headline: "Theresa May will stay as Prime Minister and get the job done," Interior Minister Amber Rudd wrote in The Telegraph newspaper that "she should stay". May's de facto deputy, Damian Green, also said she would carry on. But the former party chairman, Grant Shapps, said May should call a leadership contest. "I think she should call a leadership election," Shapps told BBC Radio 5 live on Friday. He said that after May's bungled election, her failure to unite the Cabinet and a poor party conference, "the writing is on the wall." Shapps, who chaired the party between 2012 and 2015, said up to 30 Conservative lawmakers backed the bid to informally tell May to go, including five former Cabinet ministers. He said it was unclear if there would be enough support to topple May. To trigger a formal leadership challenge, 48 Conservative lawmakers need to write to the chairman of the party's so-called 1922 Committee. May made no public appearances on Thursday. Her survival has so far been dependent on the absence of an obvious successor who could unite the split party around Brexit and fear of an election that many Conservatives think would let opposition Labour leader Jeremy Corbyn into power. "I know that she is as determined as ever to get on with the job, she sees it as her duty to do so and she will carry on and she will make a success of this government," Green, the first secretary of state, told BBC television. The Sun, Britain's most popular newspaper, said that a bid to topple May since the speech had failed after rebel Conservative lawmakers admitted they did not yet have the numbers to oust her. A spokesman for the Conservative Party did not respond to requests for comment. Many Conservative activists fear another leadership contest will exacerbate the divide in the party over Europe, an issue that helped sink the previous three Conservative prime ministers - David Cameron, John Major and Margaret Thatcher. A leadership contest could also pave the way for an election that some Conservatives worry could be won by Corbyn, whom they cast as a Marxist seeking to impose a socialist fantasy on Britain.